The GSEE leadership revealed completely its transformation to a trade union MAFIA, aiming to impose the presence of employers inside the trade unions with all means. On March 20, the GSEE held a so called “assembly” of its General Council, where they warmly welcomed as member of the GSEE leadership the businessman, CEO and shareholder in various corporations, Dimitris Karageorgopoulos. At the same time members of the GSEE leadership attacked against the Secretary of the National Federation of Pensioners of Greece, a 70 year old man, unionist representative of the Pensioners. In these conditions the GSEE leadership announced that they are planning to realize “Congress” for the General Confederation of Workers of Greece that will be only for a few hours and its only function will be to accept the employers-delegates and elect them. A “Congress”-circus, with no discussion, no procedures, no functions, only elections that will confirm the participation of the employers in the leadership of the GSEE.However, they did not say where, in which luxury hotel, remote island they plan to realize the Congress so as to be as away as possible from the workers. …WE USE THE PHRASE “CRIMINAL ORGANIZATION”…. 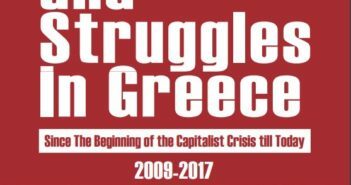 With these MAFIA practices, with armed henchmen, with collaboration with the employers and black propaganda, the members of the ETUC in Greece , they call the unionists and the unions that fight for the interests of the working class a “CRIMINAL ORGANIZATION”. 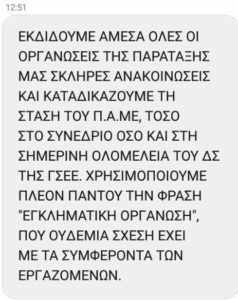 This is how they want to impose the presence and participation of the employers in the trade union movement.These developments in the Greek Trade Union movement are part of the great struggle about the role and the future of Unions in Europe and internationally. Unions of Workers for the Workers or Unions with the presence of Employers?